These strings have a gut core. The G and D strings are plain, unwound gut. The A and E are silver wound. 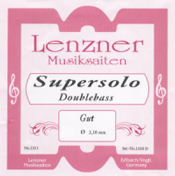 Optional Plain gut A is a thicker, lower tension string compared to the standard A. Silver Plated wound optional E is a thinner, higher tension alternative to the standard E.
The Jazz version of these strings are slightly less costly. The composition is similar to the standard strings, except the D is wound rather than being plain gut.